It has been a strange week as the holiday season intensifies. One of the results was MMMM on a Wednesday. It also forced me to delay Auction Watch #200. I want to try and do something special to celebrate #200. I didn’t have the time to pull anything together. It looks like it will have to wait until 2017. Plus, I didn’t see any auctions this week that deserved more than an Epilogue sentence. And the Epilogue is posting on Thursday because I took Friday off. There were 193 auctions as I wrote this post. I think we have always seen a downturn in auctions as the end of the year approaches. Once all the holiday bills come in we’ll see lots of auctions (and silly BIN’s) in February. – What do you think is the reserve price? I bet it is $250. – Sadly, I think this lot of 72 will get a bid. – Awfully dirty and damaged to open at $28. – “If you’re a picky collector just move on…” As you wish. – Ok lot, but I prefer the Future Strength figures. – It is a compulsion. I must look for a Non-Poster figure in a Flesh pile of figures. – Serious question, Is this a custom or an original keshi? I didn’t want an AOTW, but scotsheeha-9 forced my hand with this auction. A $49.99 opening bid, with a $69.99 BIN, for a Flesh #232. C’mon man, not cool. There were 2,509 BIN listings as I was writing this post. Damn. One BIN worth mentioning. Next week there will only be one post. It’s the 2016 Year in Review. 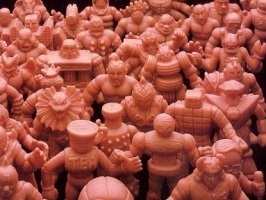 It is fairly lengthy and I asked M.U.S.C.L.E. collectors some genuine questions. I’d love to hear your thoughts in the Comments section. I hope you guys understand. I’d like to just enjoy the holidays and not worry about posting. I have every intention of returning to daily posts starting on January 2nd. I’m also skipping the specific Hanukah, Xmas, New Year post. I’d rather have the Year in Review sit at the top of the site while I’m not posting. Plus, I don’t have anything extra to say – besides, Happy Holidays! The last two years have been trying. Because of that I’ve really been enjoying the holidays this year. I hope everyone else is too. Thank you to everyone I interact with through this website. I genuinely appreciate every email, conversation, reader, and everything in-between. This Epilogue post counts as the SUS too. I could have attempted to cobble something together from these four applicable (1, 2, 3, and 4) posts. But there’s not much there. This entry was posted on Thursday, December 22nd, 2016 and is filed under UofM News. You can follow any responses to this entry through RSS 2.0. You can skip to the end and leave a response. Pinging is currently not allowed. The Turboman auction is baffling because the seller has other auctions which, although overpriced, don’t come close to the lunacy of that one. Why does he think Turboman is a highly desirable and/or more valuable figure? Sellers’ minds are fascinating. Exactly! It makes it even more confusing.